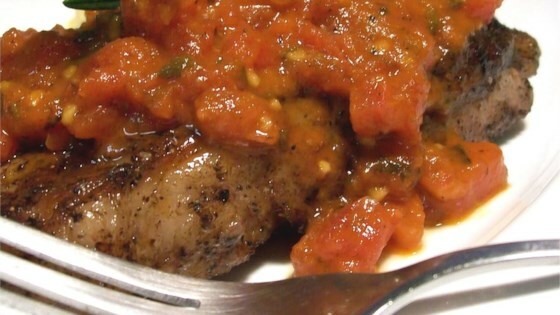 "This sauce can be made in minutes as the cooked steaks rest. To make the sauce ahead, leave out the butter. Reheat just before serving, adding water if the sauce has reduced too much, then whisk in the butter. This amount is enough for four steaks." Combine broth, vermouth, tomatoes and rosemary in a measuring cup. Pour contents of the measuring cup into a heated skillet; boil until liquid is reduced by about half. Tilt skillet so that the liquid is at one side of the pan, then whisk in butter until sauce is smooth. Spoon sauce over cooked steaks and serve immediately. Begin your passage to chefhood by mastering pan sauces.